Hawton, a small village in Nottinghamshire, in the Diocese of Southwell and the Deanery of Newark, is situated on the River Devon, 1.5 miles south of Newark. The parish church of All Saints is the only medieval building in the village. 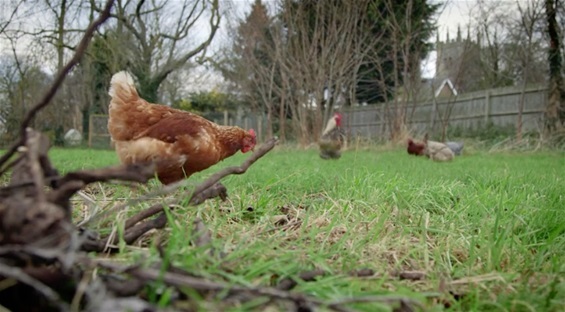 The village itself is now small, with only around 30 houses and a population of 54, and the Church is at its centre (see photo of the church in its village surroundings as shown on ITV at 7.30pm on 18th January, 2018 (Molly is the hen in the foreground). The Church itself is built of Ancaster stone and lias (limestone) and, from the road, looks as though it was constructed in one operation at about 1480. However, the church shows it has a more complex history. The first church was probably built in 1280 under the supervision of Robert de Compton, who was given the lands of Hawton by Edward I. Subsequently the nave was built in the 14th century and the tower in the 15th . The simple font also dates from the 14th century. The oak screen probably dates from the latter half of the 15thC. Of the many interesting features in Hawton Church, the 14thC Easter Sepulchre is the most famous. 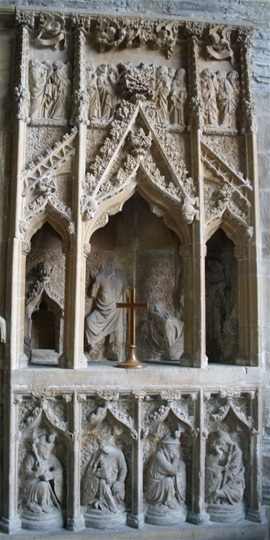 Although Easter Sepulchres were common in the Middle Ages, they were rarely permanent fixtures. There are other examples in the area but none of them are as ornate as Hawton's. It has been said there is not a better example in England. The Great West Door, the East Window, the double Piscina and the nine identified saints carved on the Sedilia combine to make this small church partuicularly fascinating. There has been conjecture that masons and carpenters from York, Lincoln and Southwell may have worked on these features. We have weddings regularly at the church, but they have to be booked at St Peter's Church, Farndon on Tuesdays at 7pm. The incumbent (vicar) owns the church. We do not have one until 11th April, so your intriguing question still needs to be answered in the absence of a vicar.